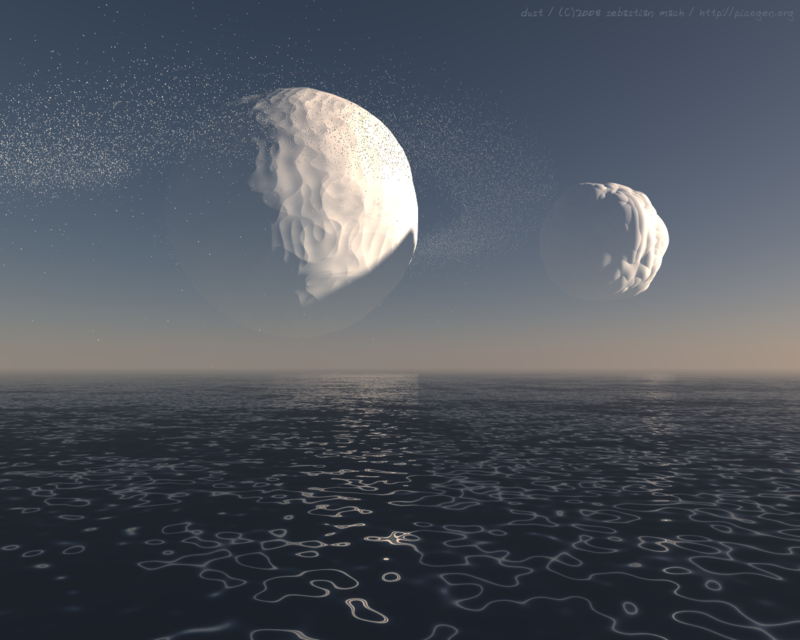 I\'ve been busy with some basic work for weather effects in picogen. In it\'s shortest possible version, here it goes (Try Number 2 will be presented in the next days, and will maybe yield a full tutorial on the tec behind). Observation C: The dust experiments from the previous post have shown that there is hell not enough memory to render all rain-/snow-elements (from hereon, I say particles) uninstanced. So, Instancing is maybe a solution, but still the memory usage grows as the scene grows, even if logarithmic. 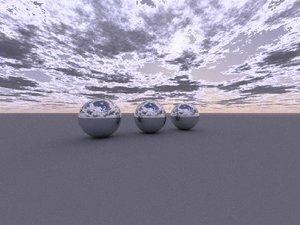 I think I will try out instancing in future to bring back unbiasedness, but now I want something I can also use for clouds-rendering. then, take some function f(s) -> 1 or 0, and let the function thus tell you if the ray hits something or not. there is it again, non-constant memory usage, non-constant time (bah). So this is not saturating, especially because the depth-value-creation is a hack. 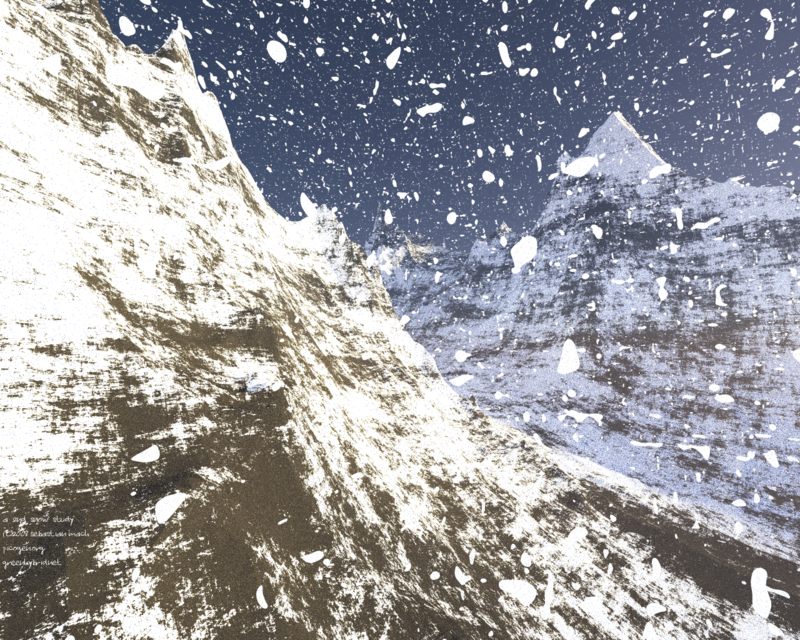 You can nevertheless check out the source-code of the snow class, with which I have created the last image. It is here: header | source. For now, I am writing too much, and thus schedule my other tec into another post here. Have a look at the two images! 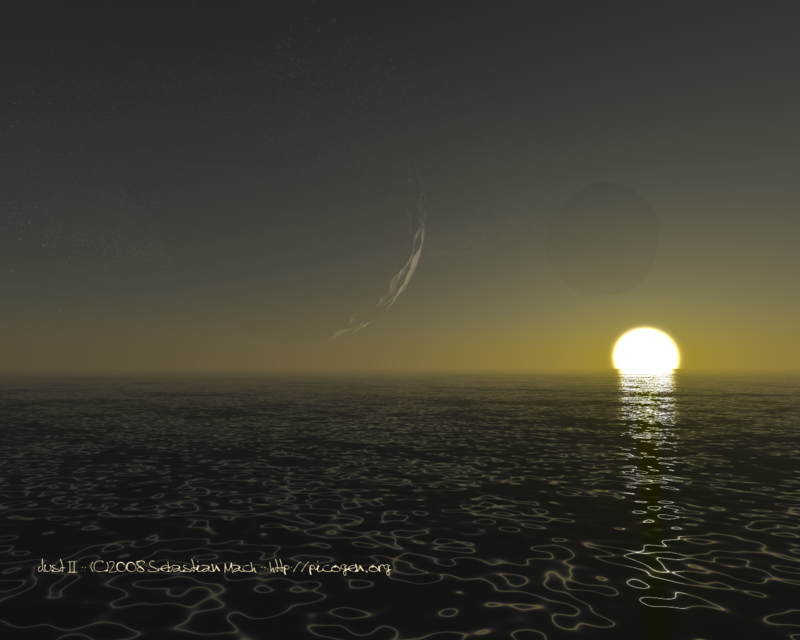 I have finally upgraded my box to 2GiB, and I eventually had to grind that a bit, so I hacked together a simple scene with hundreds of thousands micro-boxen (if you zoom in you can actually see a bit of the shading), representing the rings of the big moon. Image 2 then shows a neat sunset, where I tried out the new 2x2-antialiasing-after-HDR-saturation of picogen (but I am not really happy with it, because it still does look a bit blocky in the lower right corner). 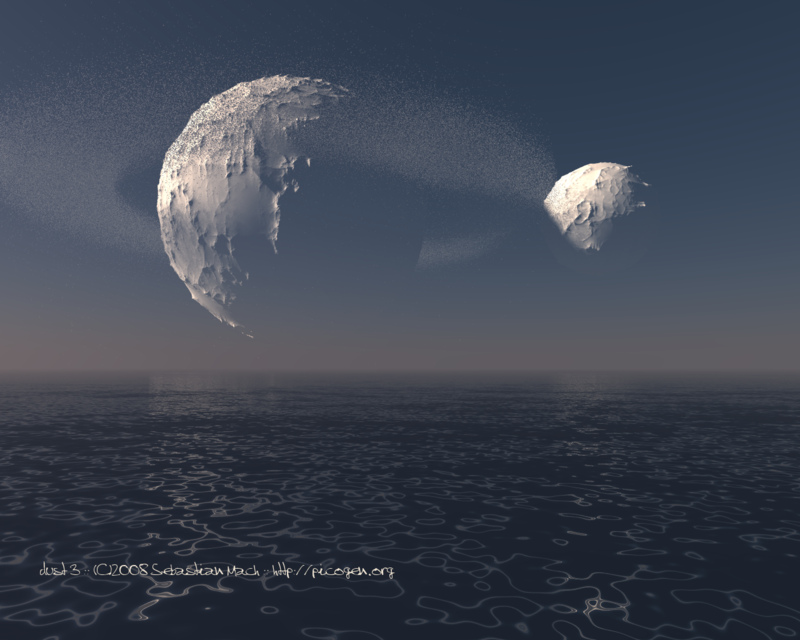 Image 3 is very similar to the first image, except that I increased the number of micro-boxen, so did I for the moons. 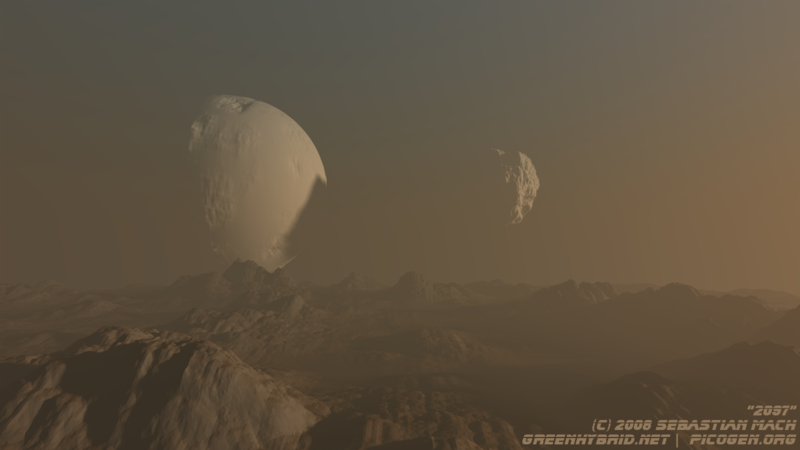 And this time I did not forget the terrain of the moons, and all in all, it was not an easy job for my old box: 2.7GiB for startup paging (that included a lot of swapping, took a good 40 minutes), and then 1.5GiB during rendering. visual facts, friend. visual facts. What I am currently working on actively is picotera, the picogen scene scripting language (which maybe becomes general enough to be used in other programs). The language is inspired by C, and provides some neat features, like builtin L-Systems, Substitutions (a kind of macro) and maybe real functional programming (http://en.wikipedia.org/wiki/Functional_programming). Lots of fun, but it was hard to get flex and bisonc++ (not bison++; where's the difference, huh ;)) to do what I wanted to be done. 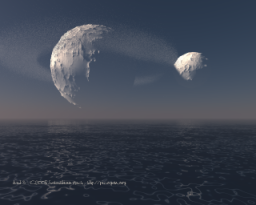 The images show some experiments with real geometry moons, that is, the moons are not part of a two dimensional skybox, but you could actually zoom onto their surface (in the image called 2097 there is even a moon that throws a shadow onto another one). 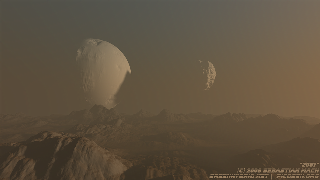 Of course, if you would zoom in, you could see that the detail is limited (actually, I used around 140,000 triangles for each moon), but at that range, it is okay. I wanted to see how to do basic arithmetics (addition,subtraction,multiplication,division) with a minimal set of axioms. I ended up with the Subtraction only, by which you can 'emulate' the other three operations, if you allow recursive functions and a bit of if-ness. Let me know if you can do it even more interesting! I want to publish the code of picogen under the terms of the GPL soon, hence I will pause major programming tasks a bit and instead concentrate on picotera, the builtin procedural scripting language of picogen. This, of course, does not mean I won't render anything. 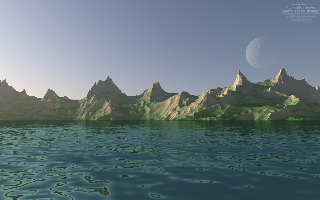 Adding in some overlapping sinewaves on the water-plane was the last piece of code I've written; the result are below. 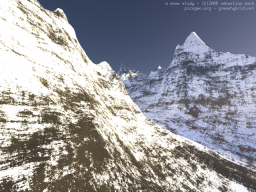 I have implemented heterofractal ridged perlin noise now, that is a multifractal, that influences it's contribution by itself. Basically speaking, in picogen/perlin-function the height and the roughness is based on the height and the roughness at a given surface point. That definition being said, try to implement that ... Really, I don't know if my implementation is like Ken Musgrave meant it, but the hills do really look neat, I guess (have a look at them below). If you are interested, try this text by Dr. Kenton Musgrave. I implemented a little microclass that enables picogen to motion-blur every object that is inherited by the IIntersectable base class. 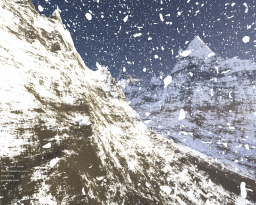 This means consequently that you can add motion-blurryness to objects like spheres, heightmaps (I hacked in a very simple heightmap-class), or whole BIH-structures. Feel free to use this code in your work! 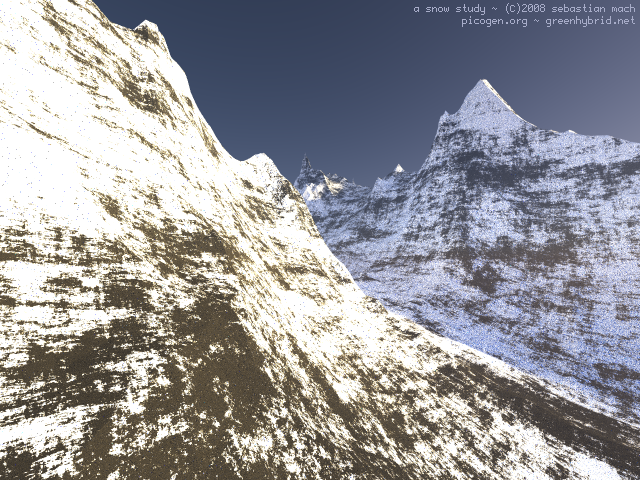 But without further babble, the good news (at least to me ;)) are that I began writing picogen, a terrain ray tracer. 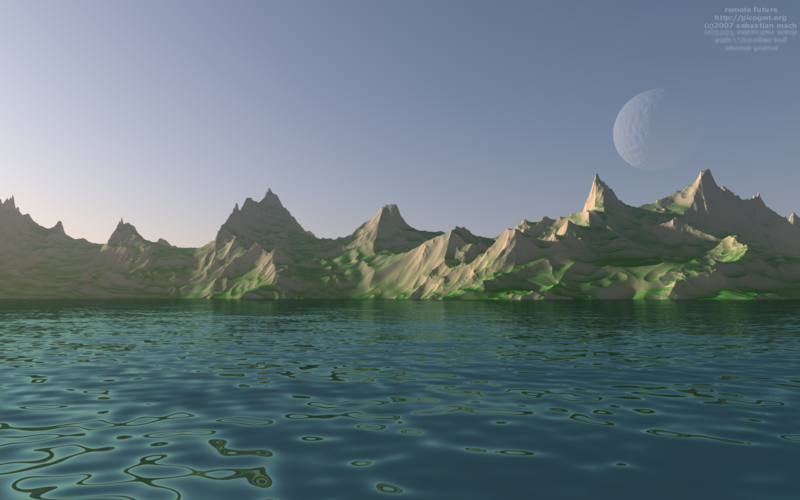 It will go open source as soon as I have implemented some sort of scene scripting. I have posted some wip's on deviantart, plus now here in the following. Very much inspired by a siggraph course-note by Ken Musgrave I have implemented some basic function-functionality (heh :D), I mean, some sort of "xyz-to-h-mappings" (applied onto the sphere, using a simple cube-sphere-mapper, on top of yet another BIH). 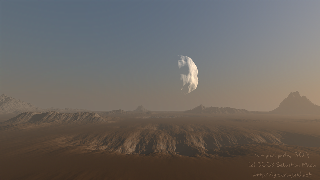 I have also tried to implement 2d-clouds, based on the Perlin Noise function and punched through Hugo Elias' exp()-mod. The shading of the clouds is based on a paper by Anthoine Bouthors. 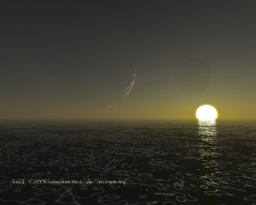 For some reason, the higher dimensional scattering did contribute to the final luminance only by a factor around 0.000001-0.001. I have written him an e-mail with fine LaTeX markup, but he did not answer .... I guess it's the study- and research-business, so I don't blame him. A quick and dirty copy-and-paste+search-and-replace did the rest for the Preetham based skylight. Lycium might remember I told him of strange colors for higher sun positions, and just recently I finally found the bug (it was in the Perez-function), and only the last of the following images shows correct Preethamness (unfortunately I've made the colors a bit to light, so it looks white overally).